Housed within the restored antiquity of a 15th-to-18th-century building complex, Barcelona’s Escola Massana center for art and design may have been the perfect place for Jesper Puchades to study his craft. And not just his professional career as an interior designer, which since 2003 has seen him employed by the likes of the Joan Lao Design Studio, MINIM, and vilablanch. No, that statured locale surely also affected his nighttime pursuits as a fine artist, an endeavor that since 2008 has seen Puchades modify designer toys into his own expressive sculptures. Doing so under the guise of HX Studio, his works frequently depict futuristic robots whose decorative paneling and rivetted exteriors have succumbed to nature’s erosive power. Mimicking how the Escola Massana required extensive attention to stave off the devastating effects of time, Puchades’ creations have no restorative angel aiding them, the artist himself carefully constructing the appearance of disrepair on his piece’s otherwise perfect exteriors. And the breadth of this aesthetic, his faux-metal works adorned with rust’s powerful pigment, are embodied within his first American solo exhibition, BOTS. More often than not, the long-term story of art is that of decay. Leonardo da Vinci‘s The Last Supper began flaking apart after only twenty years and, only six decades after its completion, it was remarked upon as “ruined“. Michelangelo‘s David, made out of sturdy marble, stood strong for around 350 years before small cracks erupted upon its left leg. And don’t forget works formed of more transient materials, like tapestries, which require constant preservation to keep from crumbling into nothingness. In the end, much like the lifespan of their creators, works of art are always on the verge of yielding to decay. Perhaps inspired by this truth, Puchades modifies plastic sculptures into the likeness of metal, two materials perceived as having longevity, before he pocks and marks them with the appearance of time’s destructive passing. While Puchades’ aesthetic could be interpreted as embodying the memento mori philosophy, reflections and reminders of mortality, their robotic appearance makes them decidedly inhuman and thus possibly capable of outlasting humankind itself. With the artist obviously capable of pristine and perfect executions, exemplified through his colorful and clean decorative swaths, one concludes that the mechanical subject matter and its decayed state are conscious choices he’s made. And thus his works become something grander than simple memento mori as they serve as reminders that all things are temporary, that even the most steadfast structures can eventually decay. Embracing beyond the inescapable cycle of life and death, Puchades’ art can be viewed as statements that virtually nothing on Earth is truly permanent. And, in so doing, the artist’s weathered and punctured pieces feel more real, more honest, Puchades himself having given them up to the damaging nature of age. But the artist’s career does have one other recurring element: heart-shaped adornment’s upon the chest of his robotic creations. Initially appearing as hand-painted detailing on several pieces, this aspect would be carried sculpturally onto Puchades’ original forms, such as 2011’s HX_log, 2012’s D.O.G., and 2013’s H&X. Included within this exhibit through the new TOBOT design, forged out of concrete with the material itself granting imperfections during the casting process, these works show the least deterioration of any displayed herein. Perhaps a result of the heart design, which implies the love that was given to these works, maybe that’s the ultimate message behind Puchades’ art: that while everything will succumb to age, the effects can be staved off if we care enough. 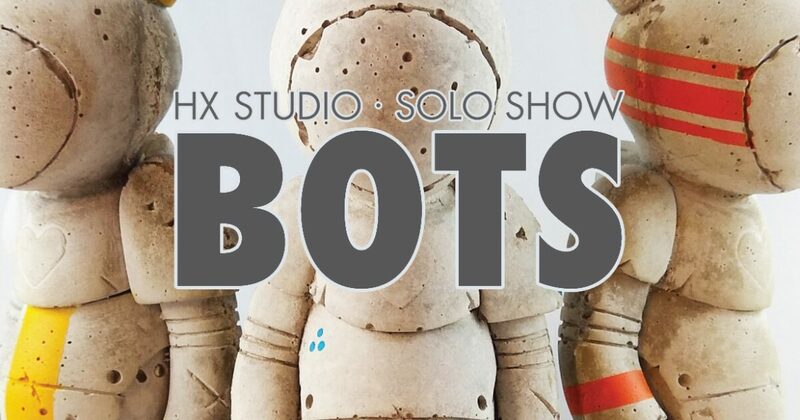 HX Studio’s BOTS solo exhibition at Clutter Magazine Gallery had its opening reception on Saturday, January 12th from 6-9pm. All works in this exhibition will remain on display until February 1st, 2019 at the gallery’s physical location (163 Main Street, Beacon, NY 12508).